I read the Tao of Pooh, which focuses on the East Asian philosophy and the innocence of Pooh. I think Pooh as a concept from England is characteristic of other myth created in England such as Alice in Wonderland. Innocence is a difficult concept to teach once we have been born into a world of environmental stress. For this reason I like to see more of Pooh associated with emptiness type philosophy such as Zen Buddhism as well. Pooh as a constant empty vessel that gets filled with different ideas is both comical and distressful. Because it makes the character of Pooh seem like they can not learn, which I do think is relevant for any animal. 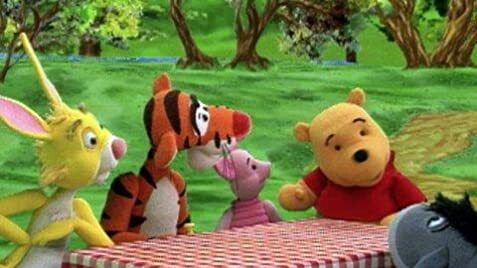 So, as the symbol of innocence Pooh has both good and bad concepts founded in education. This is why I say it is more the Tao of Pooh. The style of puppetry used in The Book of Pooh (2001) is based off a Japanese style called bunraku.